We’ve heard quite a bit of anecdotal evidence suggesting that Firefox usage saw an upswing in the frequency of crashes during the second half of 2009. This experience has generally been tied to Firefox 3.5, which was released in late June. Ideally, we’d have a lot of really rich data to tell a story around the crashiness of Firefox and the associated improvements that are being made. While some new data systems are about to hit the scene (see here and here) allowing us to figure out precisely what’s going on, we do have a couple data sets that we can rely on today. 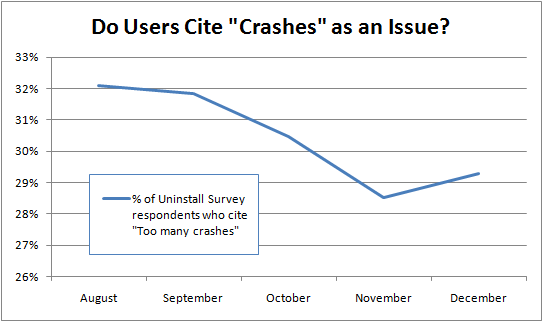 Next, let’s look at some slightly more qualitative information – the Firefox Uninstall Survey (data is available here). For the question, “Why did you uninstall Firefox?”, we can see if there’s any trend in the frequency with which people are selecting “Too many crashes” as an response option. While it is concerning that this option continues to be the #1 reason cited by users, the trend has been in decline since August. I want to stress that the data points above merely represent some very early analysis – much more is on the way! That said, the charts above do suggest, at least directionally, that efforts by the Mozilla community (e.g., CrashKill, Socorro team) have been making an impact in recent months. AC — the second chart is based on survey data from about 125,000 respondents (about 25K monthly). 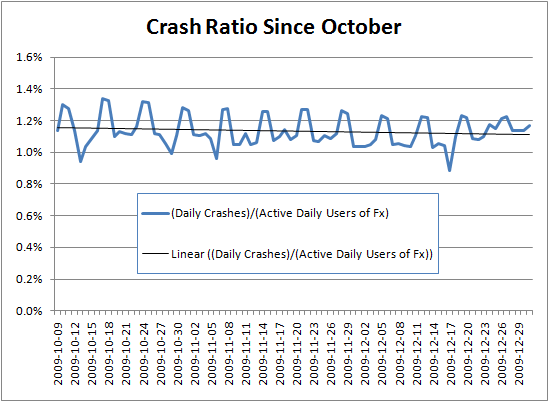 the first chart just has excel’s linear trend line added to better visualize the downward trend (i.e., no regression analysis) and it used our full sample of about 1.1 million daily crash submissions. I’ve been a firefox user for the last 3 years (I transferred over from Mozilla). I like it’s configurability, add ons and work flow. Back in 2.0/3.0 days, I could run the browser for 2 weeks and give it a hammering, and it was solid stable and still quick. Now I need to restart it approximately once per day, maybe twice. It consumes upto 650MB of RAM and becomes periodically unresponsive and very laggy. I’m sorry to say people, this software has gone a very long way backwards. I’ ve started getting used to Chrome and Opera – and I’ve even found (dare I say it) IE8 almost palatable with the downturn in Firefox’s stability. What can be done to improve Firefox? I’m really disappointed to see my favourite browser languishing. I haven’t seen an increase in crashes. They are tiny compared to IE.